Don't forget to thank your bridal shower guests! 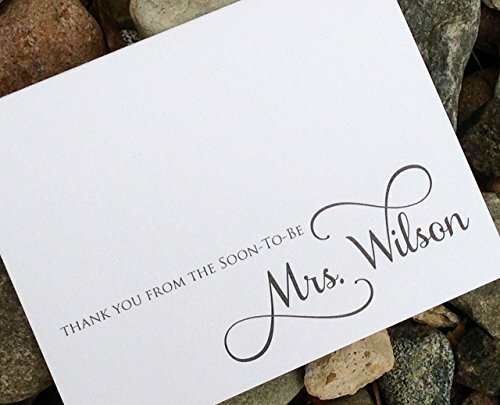 A simple yet elegant design featuring calligraphy and a bold font for a lasting impression on the recipient. In a world where text messaging and emails reduce communication to a quick glance at a screen, brighten up someone's day by sending handwritten correspondence. This listing is for 12 custom Personalized Note Cards (4.25" x 5.5" folded) with Envelopes - Printed on Thick Premium Card Stock. Quality at an affordable price. Choose your own ink colors and your envelope color (in your choice of white or kraft) to truly make the set your own. The stationery set is wrapped with a belly band and packaged in a resealable cello bag - perfect to give as a gift, or to keep as a present for yourself! If you have any questions about this product by Soiree Custom Paper Co, contact us by completing and submitting the form below. If you are looking for a specif part number, please include it with your message.